There will be monthly Bodhi Puja in consultation with Venerable resident monks on the last Friday of each month. The third Bodhi Puja will be held at the Temple , April 26, 2019 commencing 7:30 p.m. Ven. 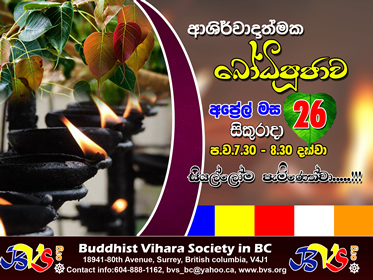 Medawala Saranapala Thero will conduct the program. This new initiative is organized by the Spiritual & Meditation sub-committee to bless everyone in the Buddhist community. We would also like to encourage any devotee family or group of devotee families join together to take advantage of sponsoring this newest puja to celebrate their special occasion. For your information, Dates for the rest of the year program is provided below for your easy reference.